BAC10 is a ultra-concentrated detergent sanitizer for sanitizing of all surfaces in restaurants, hotels in food premises section. 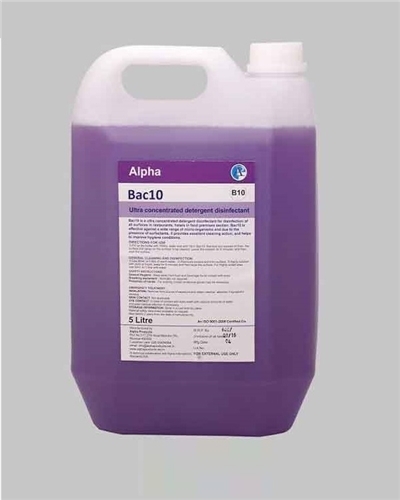 BAC10 is effective against a wide range of micro-organisms and due to the presence of surfactants, it provides excellent cleaning action, and helps to improve hygiene conditions. 1) Fill up the bottle with 750 ml water and add 10 ml Bac10. Remove any excess oil from the surface and spray on the surface to be cleaned. Leave the solution 5 minutes and then wipe the surface. 2) Use 50 ml for 1 liter of water to make an active solution, spray on to food contact surfaces and then rinse with clean water.